Do California HOA/Condo Homeowners Have The Right To Post Political Signs On Their Property Or In Their Windows? Considering how contentious the campaigns for president have been for the election of our next president, it is amazing that we have not received more requests from our California community association/HOA clients for advice on how to deal with political signs. The fact is that we have generally seen less political signs posted on properties then I remember in past elections. With respect to the presidential election, that may have something to do with people not really wanting to out themselves as a supporter of one candidate versus another. Don’t get me wrong as we have received a few requests for advice from some of our association clients, just not as many as I remember from past presidential elections. In all but one of the matters that we have been requested to consult on did we find that the homeowner did not have the right to post their sign. At one association, the board did not want the owner to have their sign posted prominently in the front window of the owner’s condominium. 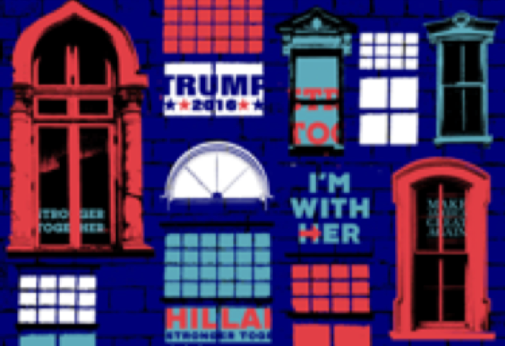 One of the board members forwarded to me the attached article that appeared in the New York Times indicating that in New York, homeowners do not have the right to place political signs in their windows or on their property unless permitted by their association. The article (follow this link) questioned whether a resident at a community association in New York has a constitutional right to post a political sign on their property. Apparently in New York, a community association can have rules prohibiting political signs or other types of signs placed in the windows or elsewhere, depending on the associations rules. But as the article also points out, next-door neighbor New Jersey has a law that prohibits community associations from prohibiting political signs. And the same is true in California. Follow this link to a prior blog post that addressed this very issue. That post dealt with prior Civil Code §1353.6 which is now Civil Code §4710. Like New Jersey, in California an owner of a unit or their tenant does have the right to post or display of noncommercial signs, posters, flags, or banners (which would include political signs or posters) on or in an owner’s separate interest, except as required for the protection of public health or safety or if the posting or display would violate a local, state, or federal law. And as long as we are talking about the election and campaign signs, I thought I would share this story about an owner at an association in South Dakota that outsmarted his HOA. Apparently the owner wanted to fly the American flag and asked his association for permission. While the board did not say no, they told the owner to raise the issue at the annual meeting. The owner was shocked that the board would put up obstacles to his installing a flagpole and flying the American flag, so he contacted a friend who lived just outside the gates to his community. He put up his 20 foot flagpole and a 4 by 6 foot American flag (which in California he would have the absolute right to do, follow this link). But he did not stop there. He also added a 3-by-10 foot Trump campaign sign encouraging voters to “Make America Great Again!”. They asked the owner to take his flagpole and sign down, a request they could not enforce because the sign and flag were not within the boundaries of the association. The owner apparently was not impressed with the board’s letter and was unwilling to take down the flag or the sign. He definitely outsmarted the board. Maybe they should not have just allowed him to install his flagpole. Follow this link to read the article.